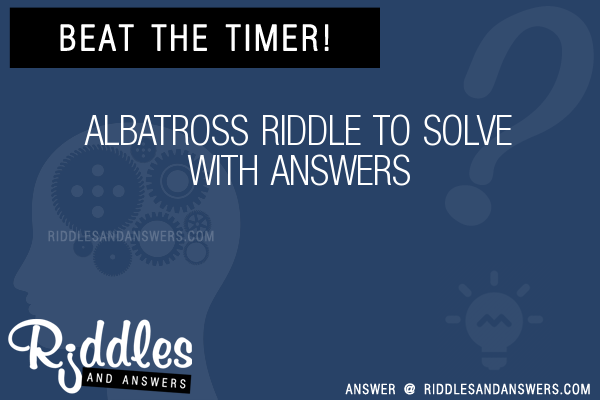 Here we've provide a compiled a list of the best albatross puzzles and riddles to solve we could find. The results compiled are acquired by taking your search "albatross" and breaking it down to search through our database for relevant content. A man walks into a restaurant, orders albatross, takes one bite of the meal, runs out into the street and is hit by a bus. Why? The man had been on a cruise with his wife. They had shipwrecked on a deserted island, and the mans wife had died. The people on the island were starving. One day the people brought some food to the man, saying that it was an albatross they had shot. When the man went to the restaurant and tasted the albatross, he realized that what he had eaten before must not have been albatross at all. He realized that he had likely eaten his wife. The thought made him so upset that he dashed out into the road without looking for traffic. Two men walk into a restaurant by the sea and sit at the bar. Both men are covered in water. Both men order a plate of Albatross and take one bite. After chewing and swallowing, the first man stands up, walks outside, and shoots himself, while the other finishes his meal. The two men were stranded out in the ocean with a third man when they were beginning to stave. When an albatross landed on their life boat and died they finally had food but it was not enough to feed all three of them. They drew straws and the looser was killed and eaten. They mixed up the human meat and the albatross meat so neither person would know what they were eating. After being rescued, the friends went to eat real Albatross and the man who killed himself realized that he was the one that ate his friend.